First we need to consider what we are going to want (or potentially want) in our environment, even if we’re not installing now. For instance I’m going to start by installing all the standard Connections applications but I know I will want to install IBM Docs and Cognos further down the road. This is a small environment which I am confident will not be growing but in most circumstances I would make sure to separate the Deployment Manager server from the Application Servers to give flexibility for the architecture going forwards. Similarly I would never install IBM HTTP Server on the same instance as the Application Server or Deployment Manager if I planned to grow the environment in the future. In our model I’ve separated the IHS server onto a Windows 2012 R2 instance for no other reason than I wanted to show it on a separate server and I wanted to talk about both Windows and Linux deployments. Update for Connections 5.5 – the previous post referred to Connections 5 and we will be installing 5.5 which shipped Dec 18th 2015. There were a Day 1 fixes for Connections which must be installed. None of the downloads I’ve listed below are optional and that certainly includes the fixpacks and fixes. You need all of these if you’re going to install Connections. I like to download the latest 64bit version. It will give you a warning when you install Connections that Connections itself is a 32bit product but I find the 64bit version works better regardless. The latest version if 1.8.4 but find all versions here with links to their downloads on Fix Central (where you’ll need to login). Comes in three parts and you’ll need all three extracted to the same directory. 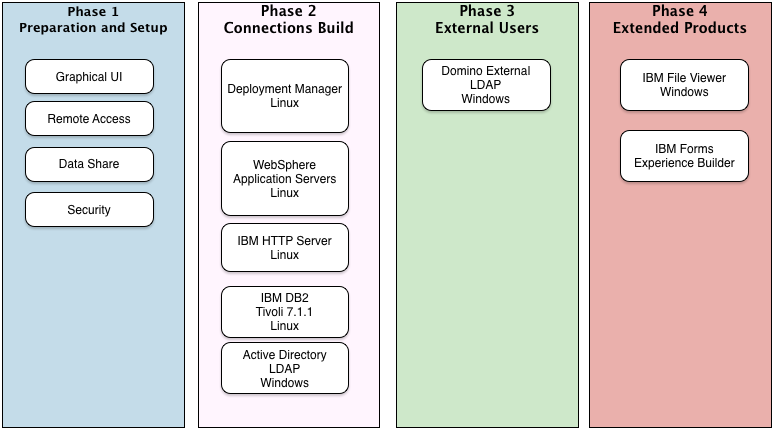 Once WebSphere is installed, Installation Manager will connect to the IBM download sites to bring down fixes and fixpacks on demand. To do this you need a login for your Passport account and your server needs to be able to connect outbound on port 80 either directly or via a proxy. I find this a much simpler way of deploying updates than finding and downloading the files so I usually don’t download them in advance. IHS is found inside the WebSphere Supplementals downloads, along with other tools that we’re not going to use here. There are once again three separate download files and you’ll need to get all three and extract them all to their own directory. Which I like to call WASSUPP because it makes me smile. DB2 10.5 Fixpack 5 (10.5.0.5) is downloadable from Fix Central via this document. I like to download the Universal Fix Pack installer. None of the downloads I’ve listed below are optional and that certainly includes the fixpacks. You need all of these if you’re going to install Connections. I like to download the latest 64bit version. It will give you a warning when you install Connections that Connections itself is a 32bit product but I find the 64bit version works better regardless. The latest version if 1.8.3 but find all versions here with links to their downloads on Fix Central (where you’ll need to login). DB2 10.5 Fixpack 4 (10.5.0.4 known as “Cancun” apparently) is downloadable from Fix Central via this document. I like to download the Universal Fix Pack installer. Although CR3 only requires an update to the Homepage schema, if you are updating from 5.0 (instead of from CR2) you also need all the updates supplied with CR1 and CR2. The script package includes all updates including the CR3 homepage and previous schema changes. IBM File Viewer will support WebSphere 8.5.5.4 as a platform although it requires an additional fix according to this link . Since Connections only just started supporting 8.5.5.4 itself (as of CR3) I haven’t installed File Viewer using that version yet, only 8.0.0.x. I’ll be using it for this blog though. IBM File Viewer itself is in theory available on http://greenhouse.lotus.com but I always struggle to get it from there. However if you can get the IBM Docs download from your passport site, we actually install a Conversion Server and a File Viewer Server which are components of IBM Docs. Installing an IBM Docs server requires separate licensing but you can use the download to install just the two components you need. I needed to start somewhere so here’s where I am starting. A “vanilla” Connections install with the components available in a standard on premises license. I’m opting to use DB2 as my database engine because it’s part of your licensing and in my experience is the most deployed. If you’re still reading we’ll see where we go after that..